The US Presidential Election, which took place on November 8th, 2016 was unprecedented and will likely go down in history as the biggest political upset of all time. Former Secretary of State and First Lady Hilary Rodham Clinton ran against billionaire New York businessman Donald Trump. Polls and news outlets all over the country and world all predicted a victory for Clinton but around 3am Eastern Daylight Savings time on November 9th, 2016, Donald Trump was declared the winner. After a controversial and divisive campaign, the USA and the world reel in shock and try to process how something like this could happen. Something we hear about every day is scams: fake checks in the mail, or “You’ve won a trip to Hawaii”. These hoaxes are designed to get the victim to hand over their personal information, resulting in identity theft which can cause among other things, financial ruin. 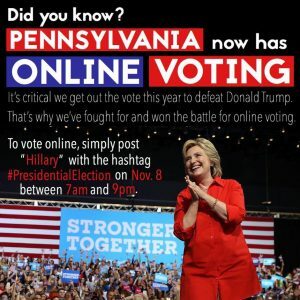 Among the recent scams, in the days before the election, people on social media networks such as Twitter and Facebook were seeing very realistic looking ads which appeared to be from Clinton’s campaign (see image below) circulating on their feeds about how they could vote by simply using their phone to text their vote. The ads appeared in both English and Spanish and circulated for a bit before Twitter began blocking them for fraudulent content. These scams were an attempt to keep voters away from the polls as you cannot vote with your phone; in the United States, you can only vote via in person at the polling station or via mail with a paper absentee ballot. At this time, it is unknown and we are only speculating what role this scam might have had in the final outcome of the election but it will be interesting to know. Was this attempt successful or unsuccessful?